PESHAWAR: With two months having passed since a landmark constitutional amendment was passed to merge the tribal areas with the settled districts, the civil society in the province has demanded quick and transparent implementation of reforms in the erstwhile tribal agencies. PESHAWAR: The Khyber Pakhtunkhwa government has decided to amend its much-appreciated Right to Information (RTI) Act 2013 which is feared to render the law stingless besides hampering its ineffectiveness. PESHAWAR: Many civil society organisations have opposed the proposed ‘controversial’ amendments to the Khyber Pakhtunkhwa Right to Information Act, 2013, declaring the government’s move contrary to the people’s fundamental rights. PESHAWAR: As Tuesday’s sitting was adjourned owing to a boycott by lawmakers over Baldev Kumar’s appearance, the provincial government could not table a controversial amendment to right to information law. 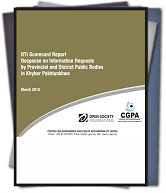 PESHAWAR: Centre for Governance and Public Accountability (CGPA) has demanded the Khyber Pakhtunkhwa (KP) government to notify rules under the KP Right to Information Act 2013. PESHAWAR: Awami National Party has secured top slot for its contribution to total business of Khyber Pakhtunkhwa Assembly till June 2016, says a report.